December 19, 2016, New Delhi:The demonetisation scheme announced by Prime Minister Modi on Nov 8th has gotten mixed assessment from citizens and media. The cause which had a high level of citizen support early on has seen its implementation ratings by citizens go down in recent weeks. Many citizens now believe that with a large portion of black money entering the banking system, it is no longer a surgical strike on black money. The Government on the other hand is hopeful that by restricting cash withdrawals, applying big data analytics, it will be able to identify the launderers. To offset the cash availability in the economy, the Government is promoting cashless transactions as they can be easily tracked. The big question is, are we ready for cashless revolution as a country. While the 700 million Indians may still rely largely on cash, are the 300M Indians who live in Tier 1, 2 and 3 cities of India, ready for cashless? In a recent nation wide survey conducted by citizen engagement platform LocalCircles, 72% urban Indians said that they were willing to go cashless for local purchases. In the survey in which 15,053 people participated, credit or debit cards were the most preferrd mode of cash less payments at 64%, whereas 28% still wanted to use cash for their daily purchases. Of the 72%, 62% said that they would like to transact via credit or debit cards, while 8% preferred wallets and only 2% said cheque was the preferred option. Urban population in states of Tamil Nadu, Kerala, Karnataka, Telangana, Maharashtra, Gujarat, Punjab, Uttar Pradesh and Uttarakhand have shown higher than average willingness to go cashless. 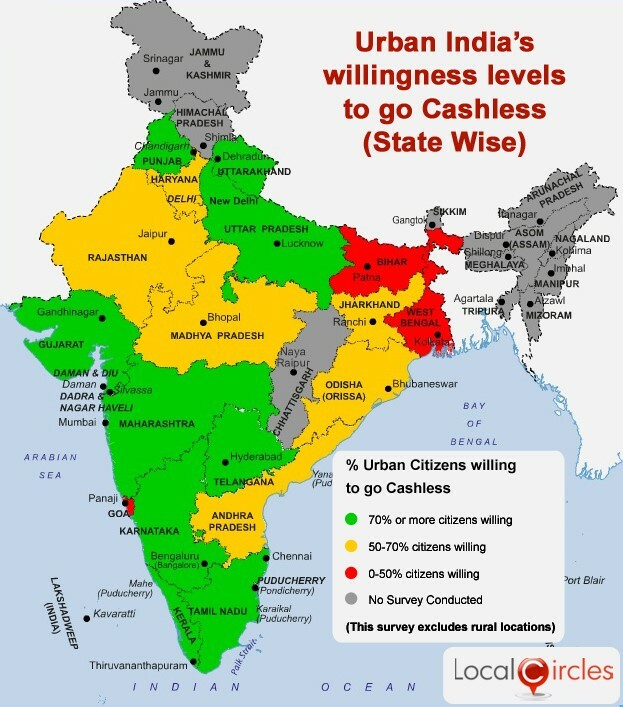 On the other hand, Bihar and West Bengal urban poulation has lowest willingness to go cashless. However, while the average Urban Indians are willing to go cashless, is the country ready for it. Do we have the infrastructure, security, capacity to support such high volumes of cashless transactions. For instance between Dec 10-12, in a LocalCircles survey, 36% citizens who tried said that they had difficulty in transacting through a debit of credit card. 16% of these said that they either could not conduct the transaction at all or the transaction got stuck mid way. 20% said that they faced some hassles and their credit/debit card transactions only went through after repeated attempts. Per citizens, strong back end infrasastructure, secure processing systesm, uninterrupted internet connectivity, good quality Point of Sale Machines are just some of the basic requirements for smooth processing of credit and debit card transactions. People also demand that all businesses should be mandated to have a card swipe machine and it should be made illegal for an establishment to charge different amounts when paid through cash or card. The inadequate IT backbone for credit and debit card transactions means that inter-operability is the need of the hour. In case of failure of a transaction, on a Visa or Mastercard the transaction should be switched to Rupay infrastructure. Banks should demand higher bandwidth at the switch level from card companies so that customers do not see transaction failure. Penalties for transaction failures should also be considered according to the citizens.